Flowers are wonderful for brightening up our gardens and homes but many serve a much greater purpose. Many flowers are, in fact, edible and a tasty addition to your diet. You have eaten flowers if you have ever eaten cauliflower, broccoli or artichokes. Here are four more flowers that you may consider adding to your healthy diet! 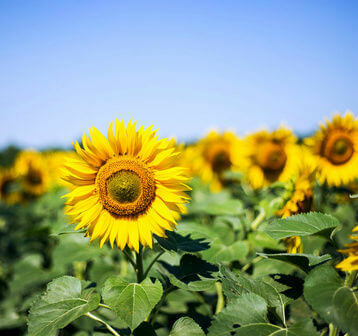 Sunflowers (Helianthus annuus) – Many people enjoy sunflower seeds but are unaware that they can actually eat the entire plant.These happy yellow flowers are a great addition to any meal. Sprouts are super tasty and great in a salad while older leaves can be boiled and enjoyed like other greens or included in a stir fry. Just be sure to remove the center stalks before eating. Flowers at the bud stage taste like artichokes and can be steamed and served with butter. You can also chop up the stalks into small pieces and enjoy in a salad like celery. Common Daylily (Hemerocallis fulva) – This cheery flower has the consistency of lettuce and a nice nutty flavor. If you want to eat daylilies be sure you take them from a source that you know has been raised in organic soil. Most people saute the unopened bud in butter or coconut oil with a little sea salt but you can also do the same with the tubers that taste a bit like a raw sweet potato. Try adding some hot or black pepper to these for a lovely side dish to a fresh salad. Dandelion (Taraxacum officinale) – Endearingly known as the weed you can eat, dandelions are more than just a menace to a pristine lawn. Dandelion greens are loaded with vitamins A and C. Be sure that you are getting your greens from a safe source that has not been sprayed with pesticides. Pick the greens when they are young before the bud opens or you will be disappointed by a strong bitterness.To eat the greens, wash them very well and place them in a pan or pot and pour boiling water over them. Allow them to boil for five minutes and season with butter and sea salt. Dandelion blooms are tasty when fried in butter. Dandelions are also popular for making tea and wine. Carnation (Dianthus) – This beautiful flower is rarely seen as an edible plant. However, it can be used for garnishing meat dishes and has a spicy taste. Before eating carnations, you must separate the petals from the calyx and remove the white base. What is left tastes like cloves and the petals make an excellent addition to salads, herb butters and jellies. Proper soil and location – Just like growing fruits or vegetables, edible flowers need special care. The location of planting will determine the overall health of the plant. The amount of sun, soil drainage, minerals in the soil, and other nearby plants all contribute to the health of a flower. Read about each edible flower you plant to ensure planting in the proper location. Proper watering and fertilizing – Edible flowers will do best when watered to keep the soil moist. Some plants however prefer a much drier soil. If your flowers are in pots or raised beds, they will need to be watered more frequently. Annual fertilizing is best done with an organic fertilizer that will not hurt you if ingested. Proper harvesting – When your plants bloom, you know that it is time for harvest. Care should be taken when harvesting so that you do not damage the plant or the flower. It is best to harvest early in the morning, or late in the evening when the air is cooler. Pick flowers and place them in a shaded basket or container. Do not crush them as you fill the basket. Gently wash and remove the stamens from each flower before serving. Store unused flowers in the fridge for up to a week. Note: Be sure that you have properly identified the flower before eating. Next articleIs Your Second Brain Addicted to this Substance? Hey Buddy!, I found this information for you: "4 Common Flowers You Can Eat". Here is the website link: https://www.thealternativedaily.com/4-common-flowers-can-eat/. Thank you.